Like a middle-aged adult, my fall market bag has steadily gained weight through spring and summer. Bags of Crimson Red potatoes tasting of chestnut, huge celeriac and fennel bulbs, enormous Italian kale and the perkiest, most vivid Dancing Chicken eggs, their color and firmness a result of the chickens foraging for food. 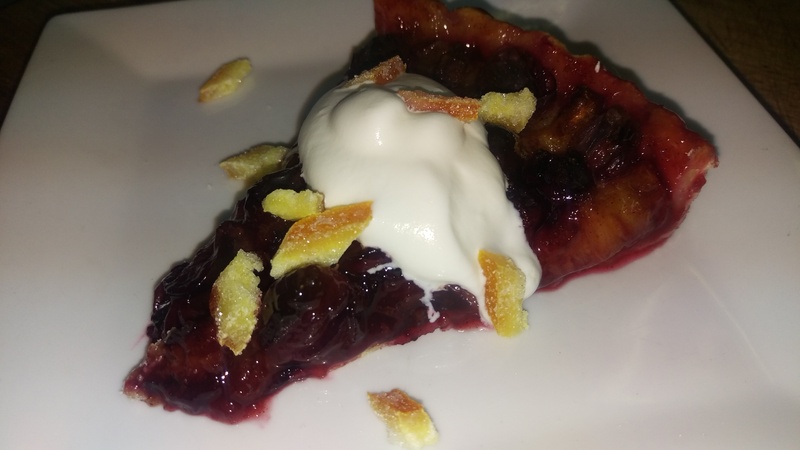 I had more of a rustic, free-form tart in mind when I left market, then one of Joel Robuchon’s recipes caught my eye. Pate brisee with a pastry cream of ground almonds, butter, sugar and egg. 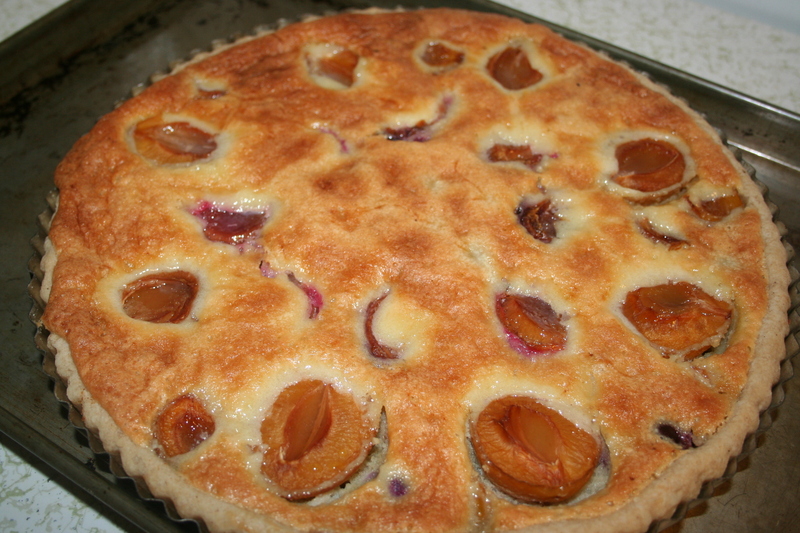 I used three types of plums: German/Croatian, Coe’s Golden and little orbed Mirabelle. The Jupiter celebate grapes were so sweet I couldn’t resist adding them. I also noticed a suggestion in Wayne Gisslen’s Professional Baking that made sense. 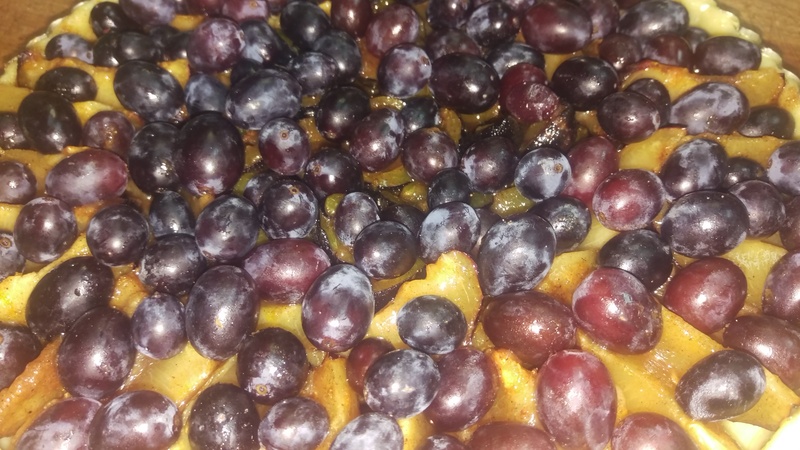 Gisslen suggested sprinkling a thin layer of cake crumbs, cookie crumbs or bread crumbs in the unbaked shell before adding the filling and fruit. The benefit is absorption of the inevitable juices produced by seasonal fruit such as plums, apricots, cherries or peaches. I had two great slices of cinnamon-raisin bread that I toasted and ground. The cinnamon in the bread and the touch I added in the crust were a nice complement to the plums. This is simple luxury, a seductive pleasure. [Sprinkle the layer of crumbs in the partially baked shell at this point.] Pour the almond cream into the prepared shell. Arrange the fruit, cut side up, on top of the cream. 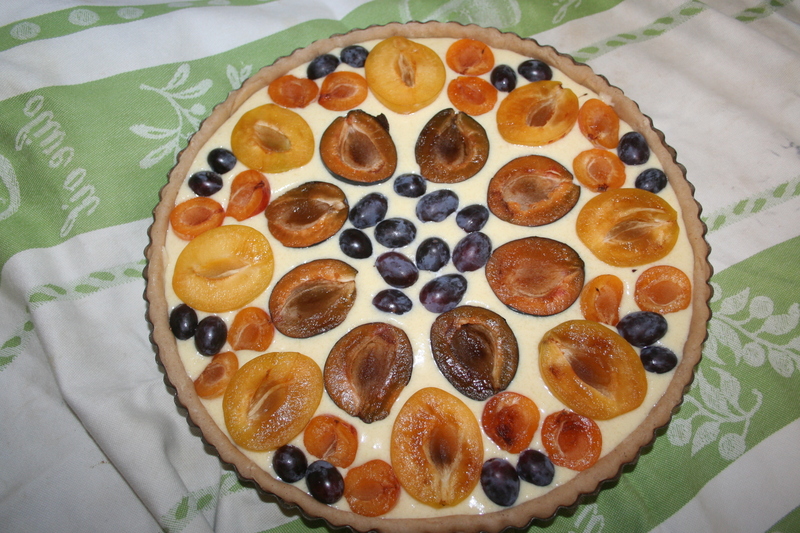 Place the tart in the center of the oven, and bake until the almond cream is golden brown and mounds up around the fruit, about 30 minutes. Transfer to a rack to cool. When cool, sprinkle with confectioners’ sugar. Serve at room temperature. This is not a description of wine. It’s lovely to realize that a fruit can can be so deeply dimensioned as to evoke gentleness in the nose and nuanced levels of flavors in the bite. The discovery of this particular apple and the conversation with the grower surrounding the discovery was another reminder to relish the entire experience of the food. 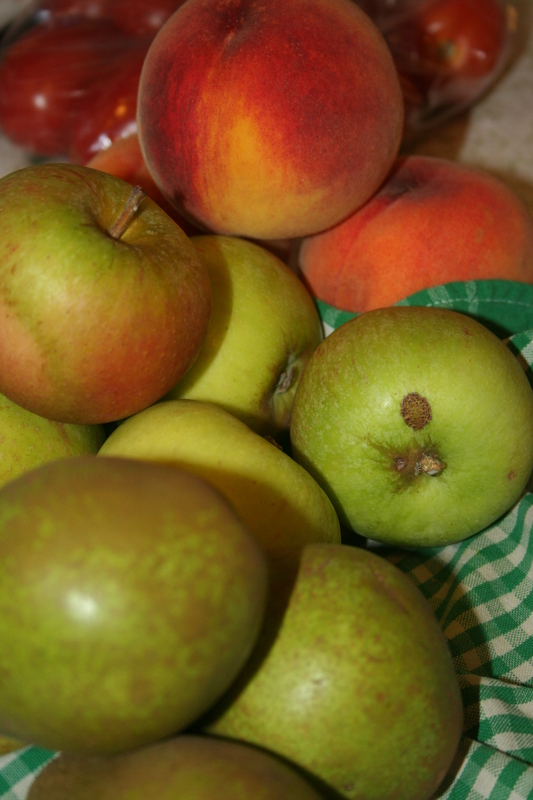 The quality of the Cox Orange Pippin apple I mentioned in a recent post proved to be well founded. It’s a wonderful little apple. 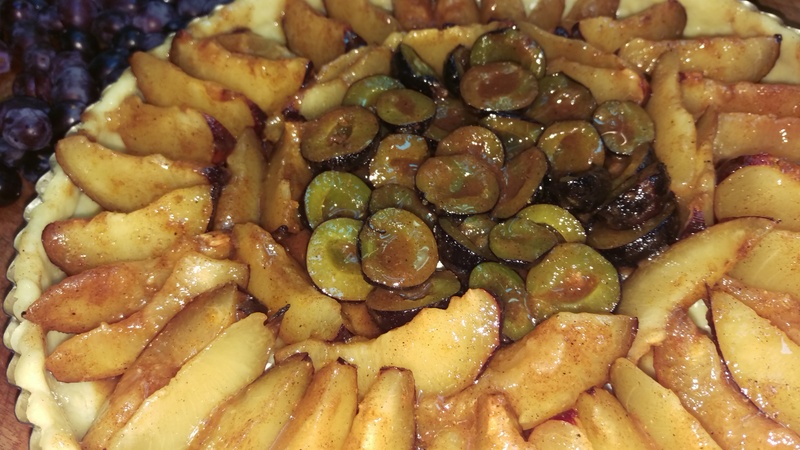 I chose to modify a tart recipe I thought would best showcase and complement the distinct flavor of the apples. A delicate brown butter custard steeped with vanilla bean, originally published in Bon Appetit. Instead of the recipe pastry which required an overnight chill, I used a pate brisee recipe with a bit of sugar and cinnamon, so the pastry recipe is not included in this post. Also, the Pippin apple is small in size. I’d have increased the quantity of apples in the recipe, had I it to do over again. Overall, the recipe is worth editing for, perhaps, a more tart apple; however, this Pippin apple needs a sublimely simple recipe where nothing but the apple shines. The tart must be served at room temperature or, preferably, warm from the oven, and softly whipped cream is a definite asset. Pre-bake the pate brisee in an 11 tart pan with removable bottom. Set aside. Whisk eggs and sugar in a medium bowl just to blend. Place butter in a medium saucepan over medium heat. Scrape in seeds from vanilla bean; add bean. Cook, stirring often, until butter foams, then browns, about 5 min. Do not allow butter solids to burn. Let cool for 10 minutes; remove bean. Slowly whisk brown butter into mixture; whisk in flour and salt. Line tart shell with apples. Pour filling over. Bake until apples are deep golden brown and filling is puffed, cracked and set in center, 70-80 min. Let tart cool in pan on a wire rack, about 2 hours. Serve warm or at room temperature with whipped cream. The fleeting ripeness of fruit at this time of the year feels like an undertow… subtly, yet unmistakably, at work in my subconscious. What brought it to the surface this weekend was one of the Hillsdale market vendors from Stephens Farm in Grand Island holding forth on his seemingly countless and somewhat odd-looking varieties of pears, strawberries, peaches and blueberries whose availability, I was told, could now be counted in days, not weeks. These fruits have a subtle intoxication in appearance, a curious lure that casts a line into my insecurity. I notice in myself a tendency to be attracted to that which I know and would like to know more about instead of automatically seeking the unknown. Not fond of writing that, but there it is. When you’re selling things, salesmanship is in order. The farmer’s subtlety ended but his point was reinforced as he continuously handed me slices of pears, plums and apples, and one was more intriguing and delicious than another. Amazing layers of sweetness. 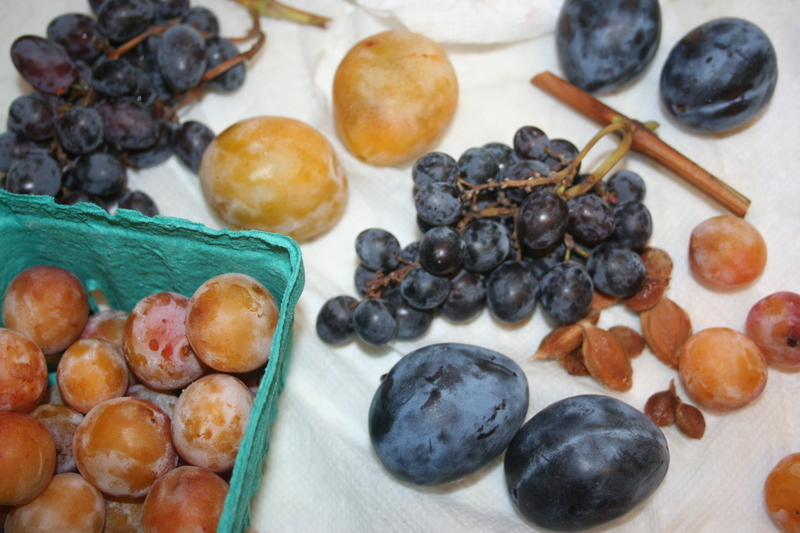 The table grapes, some with tiny seeds, some seedless, were nectar. One of the great things about the markets is that you never know where the experience will take you. And being pushed gently but steadily away from my storied comfort zone was another benefit. I’m told the apples I bought, Cox’s Orange Pippin, first grown in England in 1825, will elevate whatever I decide to make to an art form. So I’m now on the hunt for a venue that will perfectly showcase what, in a good year, could be the benchmark for flavor in apples. Brown Butter Apple Tart? Apple Tart with Caramel Sauce? 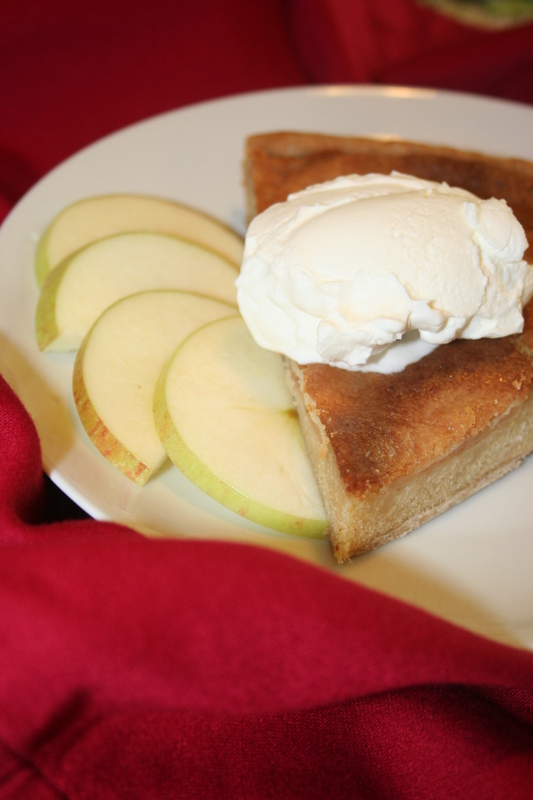 Apple Frangipane Tart? The results in an upcoming post. Here’s to pastry as art.